Surfers got a surprise over the weekend at Mavericks Beach in Half Moon Bay as they escaped a close encounter with great white shark. A professional surf rescuer used hit jet ski to scare off the shark and managed to get people out of the water and back to shore. Anoushah Rasta reports. 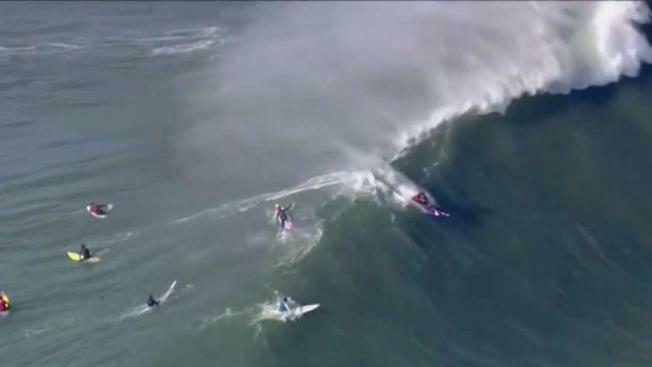 It was a close call for surfers at Mavericks Beach in Half Moon Bay over the weekend. Instead of hitting the waves, surfers escaped an encounter with a great white shark with the help of a stranger. "I was sitting on my ski watching the surf when from the corner of my eye, I see something huge rising up from below," said Drake Stanley, a professional surf rescuer. At first, Stanley mistook the animal for a whale because of its large size. Stanley described the shark could have easily measured 16 to 18 feet long. "As it came up, I could see every detail of its eyes and teeth," Stanley said. The great white began swimming toward an unsuspecting surfer nearby. Stanley then drove his jet ski towards the shark in order to scare it off, and luckily the animal turned around and swam out back to sea. Stanley then took his jet ski and picked up as many people from the water as he could and took them back to shore. "It was definitely the biggest shark I’ve ever seen," Stanley said.